Policy for a particular sector helps that sector to be enriched with potentiality. Unlike other sectors in our country, occupational safety and health sector in employment environment is undoubtedly a crucial part upon which the industrial production potentiality relies. But it is a matter of regret that the occupational safety and health sector is always a neglected issue and at the same time there is no specific policy yet to govern this sector. Basically policy is a guideline according to which that particular sector is administered smoothly and which maintains the governing-procedure of that sector too. There are some mentionable policies in our country, such as, National Health Policy (2000), Industrial Policy (2005), National Nutrition Policy, National Labour Policy (1980), National Policy on Maternal Health etc, but all of these policies have been drafted considering the general point of view and contains matters relating to general issues while the occupational safety and health issue is a special one which demands more attention from the authority as well as general people of our society. The National Health Policy, 2000: The ultimate purpose of drafting the National Health Policy, 2000 (consisted of ten policy) was to provide primary health care to the rural people and it is quite impossible to deliver this care (primary health care) to the people related to a particular occupation, whether formal or informal, because most of the facilities remain in large industrial cities which are totally out of their reach and furthermore there is a significant difference between the care for general people and the people involved in any occupation as the occupational diseases and injuries always need more active treatment than the ordinary ones. The National Industrial Policy, 2005: The national industrial policy, 2005 quietly focuses on duly specified field or sector. In the national industrial policy, the matter of occupational safety and health is totally avoided though it is an impossible task to build an industrially developed country without a healthy and secured human resource as they are the key role player in boosting an industrial development. The National Policy of Maternal Health is basically a general issue while the treatment or care is alike for all. But the vital factor here is that the necessary facilities required for pregnant women remain out of reach of the female pregnant workers as the adverse employment environment (working environment) compels them to be deprived of those opportunities. For this, it is urgent to draft a special and effective policy particularly for those engaged in certain occupations to recap all of these loopholes. Basically the main factor for drafting this policy was to ensure the optimal nutrition requirements of the rural women, more specifically during the maternity period, and a project of the government in this regard is undergoing throughout the country. A leading question here arises that does it (the national nutrition policy) comply with the nutritional requirements of a women working in a particular factory? As it has already been stated above that most of the factories in our country are located in large cities and a female worker employed in such a factory has to, in every day of a week from dawn to dusk, stay there. There is no opportunity for her to be benefited from the service of the national nutrition project even after coming out of the boundary of the factory because of time constraint and odd hours. But if there is a distinct policy especially for that class of the society involved in any occupation, then they would be benefited to a large extent. The national labour policy, 1980 is more old than appears, where the occupational safety and health issues of the workers have been included but in too short and concise manner. Policy no.6 (4) of the national labour policy, 1980 specifically emphasizes on establishment of the necessary hospital or dispensary and supply of necessary medicines in the industrial areas. But doesn't say of any if such steps are not taken. So it is quite necessary to draft a precise and distinct policy with a wider perspective for the occupational safety and health. The health and safety issues have been provided in the provisions of chapter fifth, sixth and seventh of the Bangladesh Labour Law, 2006, and the proper and effective implementation of these provisions will remain a mere dream for us unless an occupational safety and health oriented policy is drafted immediately. 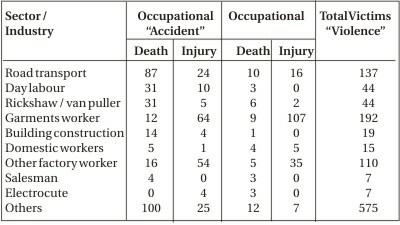 Furthermore, mere the Labour Law, 2006 is not enough to cover the vast ambit of the occupational safety and health vis-a-vis the total number of industries of our country. The World Health Report 2002 of WHO reveals that occupational risk factors account globally for a number of morbid conditions, including 37% back pain, 16% hearing loss, 13% chronic obstructive lung disease, 11% asthma, 10% injuries, 9% cancer and 2% leukemia. As the rate of occupational health casualties is very alarming and the numbers of casualties are increasing day by day, there is no alternative to formulating a precise and effective national occupational health and safety policy for the better advancement of the whole industrial sector of our country which will definitely pave the way for achieving the millennium development goals (MDGs). The writer is an assistant programme officer, Bangladesh Occupational Safety, Health and Environment Foundation (OSHE).